2017 is more than half finished now, but that doesn’t mean there still aren’t plenty of great movies coming out between August and New Year’s Eve. I recently researched what films are scheduled to come out over the next 5 months, and I was surprised by how many of them I’m looking forward to watching. 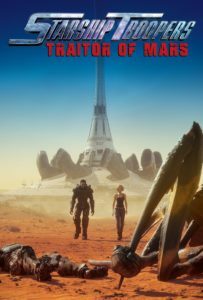 Starship Troopers: Traitor of Mars. In theatres on August 21. I’m going to cut straight to the point here. Was the original Starship Troopers movie from 1997 cheesy? Yes, and that was a huge part of the appeal of it for me. Sometimes the best scifi is the kind that involves fighting gigantic bugs on faraway planets and occasionally cutting away to a futuristic commercial. I can’t wait to see what else is going on in this universe. It’s one of the best ideas for a 90s sequel that Hollywood has had since Fuller House was announced. Geostorm. In theatres on October 20. 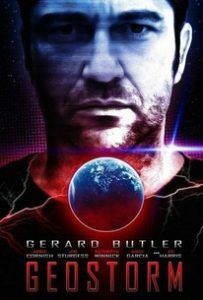 There have been many natural disaster movies made in the past, but I can’t think of a single one that was caused by malfunctioning computers. This plot point alone was enough to make me curious about this film. I’m assuming that a hurricane is a hurricane no matter how it came about, but there’s always the possibility that the writers have come up with some truly creative twists on this old trope. This is the kind of movie that I’d want to wait to rent until it was available on iTunes. As interested as I am in watching it, it will be even better if I can watch it from the comfort of my own home. It doesn’t strike me as something that requires a big screen and a room full of strangers in order to enjoy it. Then again, I feel that way about almost all films these days. The Shape of Water. In theatres on December 8. If I could only pick one of these movies to watch, The Shape of Water would be it without question. Guillermo del Toro won me over years ago with Pan’s Labryinth. 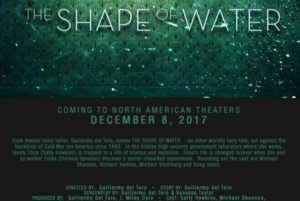 The Shape of Water is promising to be every bit as interesting as that story, so I can’t wait to see if it measures up to my expectations. I’m purposefully avoiding all spoilers for it. My regular readers know that I strongly dislike spoilers in general, and those feelings are only intensified by something that sounds like it’s going to a lot of fun to watch. Miss Kiet’s Children. In theatres on December 13. Wow, this looks like a tearjerker. I have a lot of compassion for immigrants in general, but immigration must be even more difficult for children who aren’t necessarily old enough to understand the conflicts that forced their families to move so far away from where they were born. One of the things I enjoy the most about documentaries is getting the chance to see the world through other people’s eyes. 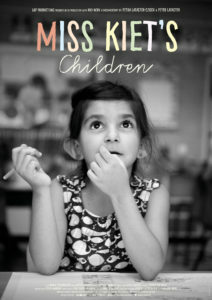 I know very little about the political or social situation in the Netherlands, so I’ll be watching Miss Kiet’s Children with the hope of changing that. Ferdinand. In theatres on December 15. When I was in high school, a friend of mine dated a cute boy named Ferdinand. This movie is NOT about their relationship in any way, but the title of it did make me pause and smile at that memory before watching the preview. 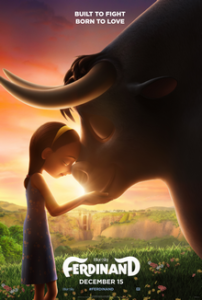 Ferdinand is actually about a bull who doesn’t want to fight anyone. I’m intrigued by that concept and hope that the storytelling will live up to the premise. From what I’ve read about it so far, I’m expecting to enjoy this story quite a bit. If you have a Twitter account, come over and tell me what movies you’re looking forward to seeing the most between now until the end of the year.